My Name is Jorge Quijada. I am one of the Presidents of the Die Hard Raiders Booster Club and Co-Founder of Die Hard Raiders Brand. I was born in Hollywood California and moved to Phoenix Arizona when I was younger. The only thing that did not change was my love for the Oakland/Los Angeles Raiders. From the first time I got goose bumps at the Oakland Stadium, to the first game I went to a game at Los Angeles Memorial Coliseum, my love for the Silver & Black has never left me! I remember growing up, how happy I was when I got my first Started Bomber Jacket, to when I got my first Timmy Brown rookie card! 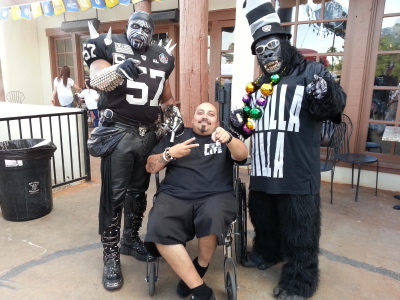 Being a Raider fan is not a fad nor a seasonal hobby, but it is a way of life that you wear proudly year round! I am blessed to be part of the Die Hard Raiders Booster Club and Die Hard Raiders Brand. We love to share in the great contributions we are doing for not only our families but our communities! I am committed to making the Die Hard Raiders the best Oakland Raiders booster club in Phoenix, Chandler, Tempe, Mesa and all of Arizona! My Name is Julio Armas. 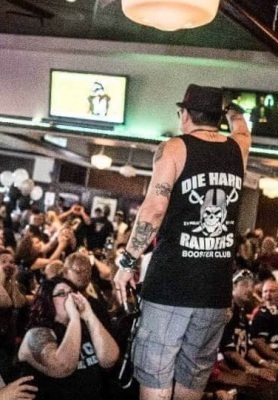 I am one of the Presidents of Die Hard Raiders Booster Club and Co-Founder of Die Hard Raiders Brand. Im originally from San Fernando, CA but now live in Chandler, AZ. I was born on July 14 1977, I am a Cancer. At my age Ive learned a lot, Ive learned to be passionate about what you do, who you are and what you believe in. Ive always been passionate about the teams I cheer for. I grew up watching the Raiders. Watching Bo Jackson and Marcus Allen. At an early age I didnt understand the Xs & Os of the game but I understood what Al Davis had created. I wanted to be a part of the rebel team he created that so many teams in the league hated or feared. I say over the last 20 years that Ive been really paying attention and following the Raiders I can say Al Davis really did it his way. He did anything he wanted to do no matter what anyone thought of him, who criticized him or who tried to stop him. He faced every challenge with Pride and he still raised his head up high no matter what the outcome was. Thats whats passionate about the Raiders. Living with pride, doing what you want to do and doing it your way. No matter how many times you fall get back up and do it again. I dont have a single special game memory I have many, but I do have a childhood memories I will never forget. Growing up with an elderly neighbor named Robert Pacheco SR. He would watch the games with his house windows opened, volume turned up to max and I can hear the game from my bedroom window or back yard. I sometimes try to replica that. I am commited to making the Die Hard Raiders the best Oakland Raiders booster club in Phoenix, Chandler, Tempe, Mesa and all of Arizona! Living in Chandler AZ.... By way of Long Beach California! My first football experience was a Los Angeles rams game. I guess I wasnt very impressed at 13 yrs old. The following year was 1982 and the raiders moved to L.A. I went to a raider game and was overwhelmed by the huge spectacular that was the raiders. It was the biggest event I had ever attended in my life. The coliseum, the movie stars , the rock stars and all of L.A was there and most importantly THE RAIDERS. Ever since that day its been my lifestyle. My favorite player of all time is tim brown. He is the epidemy of the term hard working man. 110% all day everyday.HE NEVER GAVE UP!!! He is commited to making the Die Hard Raiders Arizona's Top Raider Booster Club! I'm a wife, a mother and a nana. I have four kids and a grandson and a crazy husband who I absolutely adore and love to death. I'm from Hollywood, California and was born in east la. I've been a Raiders fan for 42 years, I was born into it. I'm as old school as old school can get. I thank the Lord every day for the beautiful family and awesome friends He has blessed me with and the opportunity to give back to those in need. My motto is walking by faith and I do that to the fullest everyday. She is commited to making the Die Hard Raiders Arizona's Top Raider Booster Club! I was born and raise in San Fernando. I moved to Arizona in 1997. I first knowledge the Raiders when I was 14. My first game was against the chargers. I remember that day, we had my cousins quince practice and all the boys were inpatient they wanted to leave the practice to go to the game. So a lot of the girls wanted to go and force the boys to take us. It was the atmosphere I fell in love with and turned me to a Raiderette. My favorite Raider is Bo Jackson because Bo Knows he is the ALL-STAR. She is commited to making the Die Hard Raiders Arizona's Top Raider Booster Club! What's up Raider Nation! My name is Rich Santoyo. I'm a DIE HARD RAIDERS FAN! That's why this club fits me just right! I'm originally from the 805 and beautiful city of Santa Barbara California and now live in the city of Gilbert Arizona. I've been a Raider Fan ever since I was a kid. I remember my older brothers were L.A. Rams fans and tried to persuade me to join them but the color of the Silver and Black was just so appealing that I just had to rebel and go to the dark side. I'm so happy I made that decision because being a part of the Raider Nation is like being a part of a family. I love my other sport teams but I don't have the same feeling as I do when I put on the Silver and Black. My favorite player is Marcus Allen and my favorite Raider moment is when the Raiders were in Super Bowl XVIII against the Redskins. Marcus Allen set a Super Bowl rushing record and broke an amazing 74 yard touchdown run when he reversed directions and went the distance for a touchdown. I remember the headlines read "Raiders take the Hogs to the Slaughter house with a 38-9 win!" Classic! The last couple of years have been awesome! DHRBC is my family and I'm proud to be called a Die Hard Raiders Booster Club member. 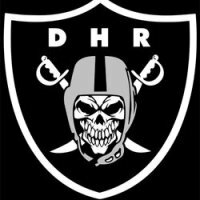 DHR4L! Go to our Events page for this week Events or Click Events Button Below!